'11/8/16': A Day That Changed America, Through Many Lenses This documentary, compiled from 16 short films by different directors shot on Election Day 2016, offers "a tightly woven series of close-ups of a diverse, divided populace." 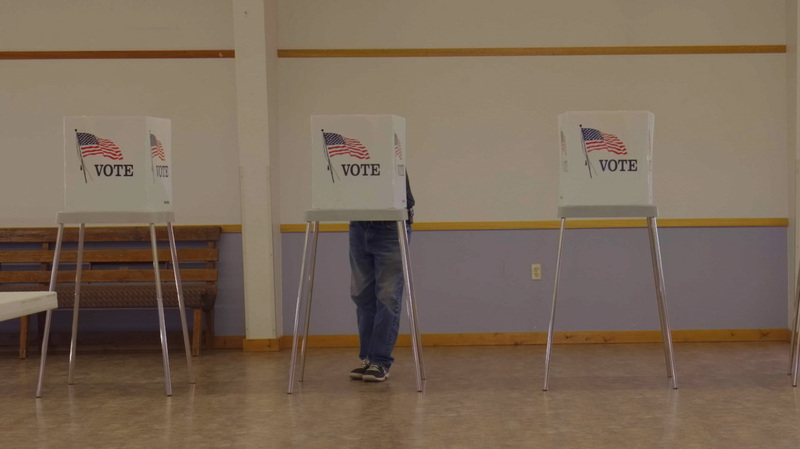 In 11/8/16, 18 documentary filmmakers produce 16 short films examining Election Day 2016. There's one thing curator-producer Jeff Deutchman couldn't have known when he set out to make 11/8/16, a coast-to-coast, dawn-to-midnight look at the most recent U.S. presidential election day. Not who was going to win, but how inescapable the effects of that victory would be. With Donald Trump at the center of every single day's news cycle, many will be reluctant to revisit the moment he took the presidency. But Deutchman's movie — also the movie of the 18 filmmakers who shot the 16 individual segments — is not about Trump and his rivals. (Gary Johnson and Jill Stein aren't even mentioned.) It's a tightly woven series of closeups of a diverse, divided populace. Many of the people followed on that day see their vote as an expression of their identity, whether as coal miner, military veteran, small-business owner, or Sikh or Latino first-generation American. Two of the subjects are voting for the first time, one because she's just become old enough, the other after spending 30 years on death row for a murder he didn't commit. He wears his "I voted" sticker until the movie's very last, post-credits scene. Also portrayed are a few people who can't or won't vote, including one who says, "that's a game you cannot win" — even though he's African-American, and acknowledges the essential struggle to expand voting rights to people like him. The film's Greek choruses are two news organizations: the Los Angeles Times and WHYY, Philadelphia's NPR affiliate. Deutchman needn't add narration or anything more than the most basic of on-screen titles, since the reporters, editors, page designers, and editorial cartoonists' frantic activity reveals the larger story. Deutchman and his collaborators, who include Alison Klayman (Ai Weiwei: Never Sorry) and Martha Shane (After Tiller), shot 50 little films, the bulk of which went entirely unused. (Some may be released in another context, the producer says.) Of the 16 Deutchman chose, all are compelling, and only one seems a little off-topic: a day with a tent-dwelling, non-voting Honolulu man who's unclear on the identities of the leading presidential candidates. The laidback Hawaii guy does serve one structural purpose: He bursts into song at the movie's end, thus underlining that the movie doesn't use, and has no need for, a musical score. You don't have to be a Clinton booster to be mystified by some of the Trump supporters' rationales. An Army veteran in Miami's Little Havana argues that the Republican candidate has benefited the country by opening "dialogue," while two coal miner's daughters reiterate extraction-industry talking points about "clean coal." Less confident is a Massachusetts woman, married to a MAGA-cap-wearing Trump enthusiast, who says she voted for her husband's candidate, but fears what he will do. The most earnest of anti-Trumpers are a Utah woman stumping for Evan McMullin and an Ohio college student doing the same for Clinton. But the left, at least as viewed through this particular kaleidoscope, is the more cynical segment of the electorate. In Vermont, an organic farmer and fringe-party candidate calls voters "stupid." In Kingston, New York, an artist says that "Donald Trump is the president our country deserves." Listening to such remarks, viewers might wish for a sequel — but not the 2020 edition probably being contemplated by Deutchman, who supervised the Obama-centric 11/4/08. It would be instructive to meet some of 11/8/16's subjects again on one day in 11/17.